You guys, he really, really wants to be one! It’s all he wants for Christmas! PLEASE let Jake G be a Movie Star! Here’s the thing. The industry has been trying for a decade to make Jake G a Movie Star and so far, general audiences aren’t having it. I’m going to say, they’ll never have it. Something is missing in the Jake G equation that would translate to him being a big Movie Star. I’m not sure what that thing is—he’s talented, handsome, charismatic, a reliable worker and good promoter. From the perspective of the people who have to sell him, it should be a no-brainer. He’s a joy to work with on set and off—good luck finding a negative Jake G story (that weirdness with Taylor Swift last year aside). The people who work with him, like him, across the board. I’ve seen Jake G in action myself. Actors like him—genuinely nice guys with good senses of humor and a solid work ethic—don’t happen every day. But I can accept that what is obvious to the industry isn’t translating to the general public. People just aren’t buying Jake G. Fine. But I do not want to hear any lamentations about “oh, we don’t have an Everyman Hero anymore, boo hoo” because Jake G has tried to be that for us and we won’t let him. Which means we don’t get to complain that there’s no under-forty, cross-generational crowd-pleaser. So stuff it with the “there aren’t any men in Hollywood anymore” and the “whatever happened to our action heroes”. And now onto Source Code, Jake G’s latest lukewarm shoulda-been-a-blockbuster. First, Source Code is a good movie. In a year where I’ve put up with so much bad my eyes have literally bled, it was a relief to finally sit down in a theater and see something not terrible. There’s a lot that works in Source Code, director Duncan Jones’ (Moon) second effort. 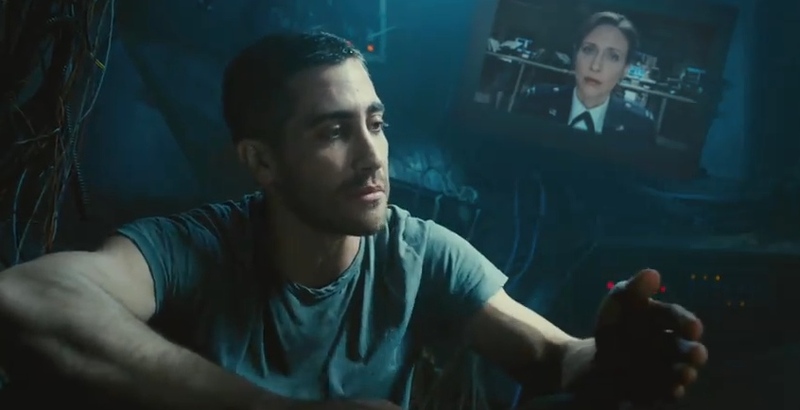 Jones has a knack for claustrophobic spaces—Air Force Captain Colter Stevens (Gyllenhaal) spends most of his time inside the Source Code’s “capsule” or in a train compartment and Jones turns both of these sets into dynamic micro-environments. 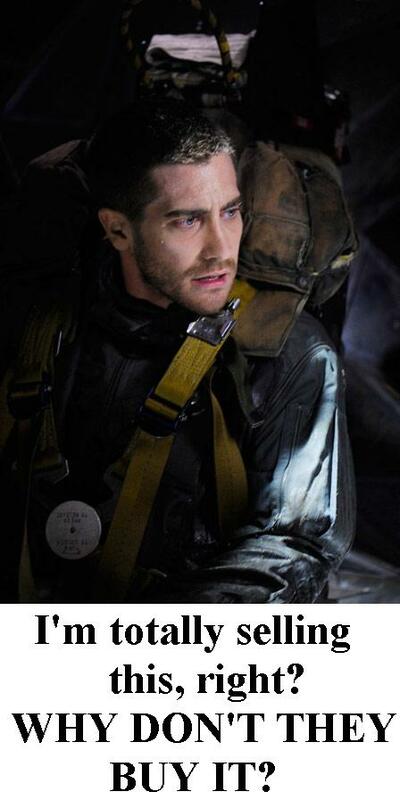 These sets also require Gyllenhaal to spend some time alone in small spaces which he does ably. He’s capable of carrying a movie of this weight by himself, which further illustrates all the ways in which he’d make an awesome action hero—but we agreed not to talk about that anymore. The plot really isn’t as convoluted as the marketing suggested (Source Code had criminally bad marketing). The gist is that Captain Stevens has been inserted into a computer program which can send him into an alternate reality, using a combination the brain’s short-term memory track and its final electromagnetic impulse at the time of death. The characters sum this up quickly then dismiss the whole argument with “it’s quantum mechanics”. The inner workings of the Source Code aren’t the point and so they’re treated in summary fashion which was fine with everyone. The point is Stevens’ quest to unravel not only what happened on a Chicago-bound commuter train but also what happened to him in real life. What “narrow specification” does he fit that makes him eligible for the Source Code? The story unwinds so tha t as we learn more about Stevens and the Source Code we really want him to find a way out of it, only to learn that death really is the only option for him. Everyone in the audience was simultaneously grossed out and bummed out when we get Captain Stevens’ big real-world reveal. Credit to Jones, again. The ending is a bit ambiguous with the Source Code working so well that it has spun out two realities—the “real” world with Captain Stevens stuck inside a computer program, and the “new” world in which he has prevented the train bombing and goes on to live the assumed life of the man on the train, Sean Fentress. In that reality, Stevens gets the girl. It reminded me strongly of Gwyneth Paltrow’s Sliding Doors. Just with bombs. Now, as for what didn’t work. Well, the “it’s quantum mechanics” dismissal of how the Source Code computer program works indicates that if pressed, no one could actually make this sound even remotely plausible. The best sci-fi endures because it’s believable. 2001: A Space Odyssey remains great sci-fi because you can kind of see that actually happening one day. I don’t think Source Code could ever happen. I also had a problem with the name “Colter Stevens”. Show me a ten-year-old named “Colter Stevens” and I’d totally buy it. It wouldn’t even be the weirdest name on the playground. But a thirty-something named “Colter Stevens”? No. Maybe “Cole”. I always want to give my characters ludicrous names, too, which is why a writing instructor had to limit me to the use of “Jane”, “Joe”, “Tony” and “Anne” for an entire year in order to break me of that habit. Just because a name sounds cool, doesn’t mean it makes sense in your story. And my final nit-picky problem with Source Code was the train. The commuter train that was bombed was part of the Chicago light rail. We call it “Metra”, the movie called it “CCR”, undoubtedly because Metra didn’t want to be seen blowing up, even just in a movie. The movie opens with several nice aerial shots of spring in Chicago (aka June). There are some nice aerials of the train on its way into the city. Now, I admit, what I’m about to outline as a problem is only a problem to the Chicago market (just like depictions of thunderstorms in Los Angeles are only a problem to LA). But it was such a huge, pointless problem that it consistently kept everyone in the audience from completely suspending their disbelief. We couldn’t do it because the movie was so consistently fake. The aerials may have been Chicago but the movie was filmed in Montreal. Fine, okay. Chicago can be stingy with its tax breaks. The only exterior set in Source Code, aside from the very end which actually was shot in Chicago, was a train station called “Glenbrook”. There is no “Glenbrook” station on any Metra line. Why not use the name of a real stop? Most the stops are named after cities—I can’t imagine Metra could actually block a production from using a city name, but if they could, just use another, non-stopped city as your fake movie stop. Glenbrook is actually a pair of large and well-known high schools which lead to lots of high school jokes during the movie. Distracting. Also, the inside of the train compartments were SO MUCH NICER than anything I’ve ever seen on Metra. I’m willing to believe these are real train interiors (or perhaps recreations of real train interiors) and that they’re so much nicer because they’re Montreal trains and everything in Canada is cleaner and nicer than in the US. At the point that they showed the Dunkin’ Donuts stand INSIDE THE TRAIN, however, suspension of disbelief was gone. Now we were all being jealous and wanting donuts stands in our real trains. I’m totally nit-picking, I know. 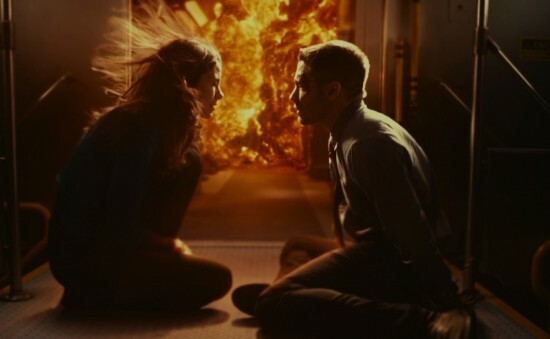 But it kind of drives me nuts when a director goes through the trouble Jones went through to craft a tense, engaging thriller only to have it destroyed by things I know are falsities. If you can’t shoot your film in the same city as it’s set, at least commit to getting the local details right. It seems almost lazy to do otherwise. And it leaves an impression of wrongness with anyone who’s familiar with the settings being recreating elsewhere. Other than that, though, Source Code is a well-made sci-fi thriller, continuing the evolution of an interesting filmmaker in Duncan Jones. It probably has something to do with the fact that he’s a closet case who partakes in Fauxmances. Why do you think no one likes Reese Witherspoon anymore? I don’t think it’s a matter of people not liking Reese Witherspoon anymore. I think she keeps making increasingly bad movies. With the exception of Walk The Line her movies have been getting steadily worse. Eventually, people get tired of paying for crap, so they stop paying for crap. Thus, How Do You Know’s dismal box office. We’ll see if she can turn this around. i don’t mean to promote gender stereotypes here, but I think the reason Jake’s not taking off is because his movies in general are too centrist. What I mean is, his action-type movies aren’t action-y enough (and maybe too cerebral as in Source Code) to get men to run out and see them and the other movies aren’t ‘chick’ enough to get women out (I’m speaking of the Mini-van majority here). I don’t want to see him do a dumb action movie like Battle LA or an insipid romcom with Katherine Heigl, but the movie goers that bring in the large box-offices do. I think part of the marketing problem with Jake G. stems from the enduring rumors that he is gay- seemingly based on the fact that Ted Casablancas invented Toothy Tile and heavily hints that it is Jake G.
I have no idea if he is gay or not- I lean towards not, because the weirdness with Swift aside, he has been in several long term relationships with women who didn’t particularly need the career boost enough to beard/fake a relationship (ie. he’s not a big enough movie star to bother *cough*like Tom Cruise*cough*). But the combination of being the “bottom” in Brokeback Mountain with the enduring Toothy Tile rumors perpetuate the perception and seem to crop up around him continually, thus driving away part of his audience- he’ll never date you, ladies/he wants to look at you in the locker room shower, men. I also think he is working against his niche- he’s not a Brad Pitt, George Clooney, Johnny Depp, Christian Bale, Leo DiCaprio or even Ryan Gosling type. He is however, a very appealing and talented actor who could have a successful career modeled after the Sam Rockwell or Mark Ruffalo model- doing good work in smaller pictures where you aren’t a box office draw but you work steadily and are respected in your field. I think he’s trying to be something that he just isn’t and ignoring what he actually is, which is actually a pretty awesome thing to be! 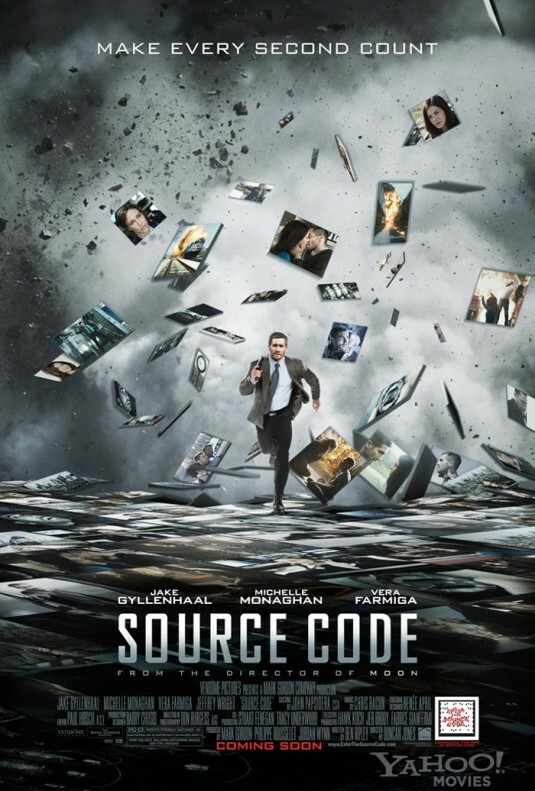 Criminally bad marketing is correct…I did not know Source Code was a Duncan Jones project. Moon was criminally underrated last year, as is its star, Sam Rockwell. Had Summit taken the time to inform me of this, I’d have seen Source Code over the weekend. Why isn’t Jake a movie star? Be because unlike the aforementioned Rockwell or Ruffalo, he just doesn’t interest me. Yes, he has the chops, yes, he’s nice to look at, yes, he appears to be the all-around package. But he seems so vanilla. And we’re seeing talent emerging in folks such as Michael Fassbender–and that man is definitely NOT vanilla. Micheal Fassbender ate up the screen in Inglorious Basterds. He has that “it” factor that sadly, Jake G does not. Hollywood backed the wrong pony after Brokeback Mountain- that movie was *all* about Ledger, r.i.p. 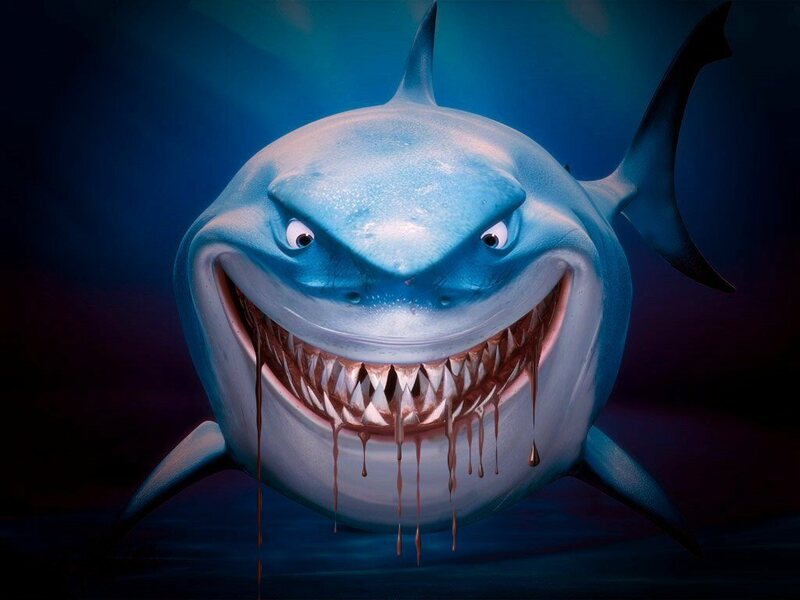 Not to be shallow, but, honestly, his face weirds me out. He’s got these big googly eyes that…well, I’m not sure what to say, but I don’t get it when there’s girls that like him. I just don’t see it. I had the same “Chicago” problem with “My Best Friend’s Wedding.” Julia Roberts leaves O’Hare airport on the correct expressway, and then magically appears on Lake Shore Drive heading toward downtown. The director did it, no doubt, to get a great shot of the city on LSD (no pun intended), but it still irks me, 14 years later. I can tell you why Jake G isnt a movie star…its because he is boring as all f***. And I certainly dont feel my eyes following him during a scene. The guy is earnest, nice and boring as snot. Ok, I am being harsh, but really, I think Jake G suffers from Parker Posey-disease. Maybe he just isnt meant to be a Leading Man. Maybe he is more of a small-budget-introspective-charactor-actor. I mean, the best actors arent always the biggest movie stars-ask Keanu. My biggest problem with the movie was not Jake’s lack of success, I thought he was amazing but with Jeffrey Wright’s performance. It was so affected and weird, I felt that there was a punchline waiting in the wings. And super nitpicky but Vera’s performance was so emotional. I would think that a solider who would know about the complexities of the project would be…wait just remembered that he couldn’t see her reactions. but still I would expect her to have just a little more composure then she had. Interesting, I often wonder it myself. 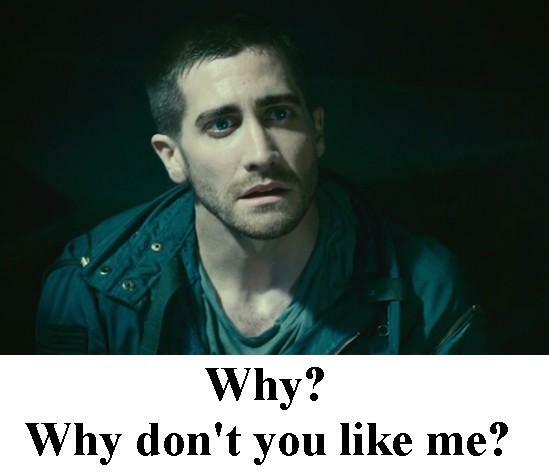 I am one of the few people that actually like Prince of Persia, Love and Other Drugs and I really liked Source Code. I don’t know why more people didn’t see it. I hope he keeps trying to be the mass superstar who can act. Unlike, say, Taylor whatshisname from Twilight. I will keep paying to see his movies.